There is no time for Michigan to hang around because they will be back on the court at noon tomorrow taking on Marquette. I didn’t catch the whole game but from what I saw, Marquette is small but very fast. They pushed the ball against Xavier in a 72 possession game and they won the game by forcing turnovers (28% TO rate for Xavier) and getting to the line (52.9% free throw rate). They managed to win despite getting dominated on the glass, rebounding only 18% of their misses and letting Xavier rebound almost half (45%) of their misses. Lazar Hayward is the biggest scoring threat for the Golden Eagles. The 6-foot-6 wing is forced to play a lot of his minutes inside but that doesn’t hurt his production. The other main scoring threat for Marquette is wing forward Jimmy Butler. Butler had a monster game versus Xavier, scoring 15 points on only 5 shots, hitting 7 of 10 free throws, pulling down 6 rebounds, and notching two steals and four blocks. Beyond those two, Marquette appears to be looking for consistent scoring options. One guy who impressed me versus Xavier was 5-foot-8 guard Maurice Acker. Acker is a game changer with his speed, and managed to score 11 points off the bench to go along with five steals and four assists. Overall Marquette’s roster is lacking any type of significant size. In their starting lineup versus Xavier, their tallest player was 6-foot-7, junior forward Joseph Fulce. Marquette big man Chris Otule suffered a season ending foot injury on Monday and gives the Eagles even less depth in the post. What Marquette can do is force turnovers. Similar to Creighton, they have lots of quickness at the guard spots and play pressure defense. The good thing for Michigan is that they are great at holding onto the ball, even a game like today’s where they struggled at times, they only turned the ball over on 15% of their possessions. 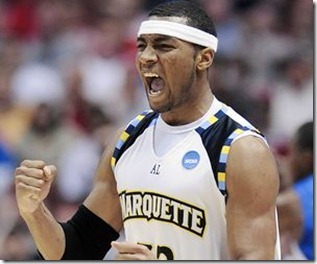 Overall, Marquette should provide another tough yet winnable game. Lazar Hayward is capable of taking over a game but this is a team that Michigan can beat if they manage to play their game. The final huge x-factor is the extremely short turnaround time with a noon tip off tomorrow.